My name is John Polstra, and I'm the amp technician at Channel Road Amplification. 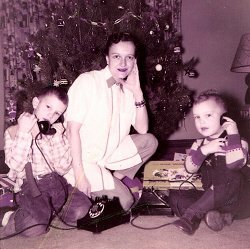 My introduction to audio electronics came at age three, when my older brother and I found a pair of telephones and a big 100-foot spool of telephone cable under the Christmas tree. My dad had gotten them from a friend who worked for Bell Telephone. At that time, everybody's phones were owned by Bell; you couldn't buy them in stores. With the phones, the wire, and a battery, my brother and I were able to talk to each other from different ends of the house. Over time, we got a bunch more wire, and eventually there were phone lines crisscrossing the house and much of the back yard. 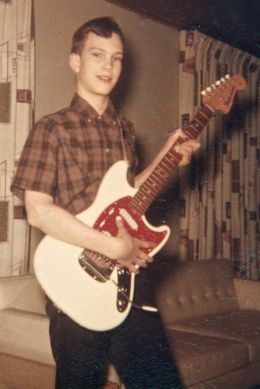 With help from my parents, my brother and I bought our first electric guitar—a brand new Fender Mustang—when I was 11 years old. We saved a little money by building a guitar cord for it from parts we already had. After awhile we noticed that our homemade guitar cord worked better than the store-bought cords our friends were using. Our friends' cords made crackling noises through their amps when the cords were flexed; our homemade cord was nice and quiet. My dad said if we'd build a few dozen guitar cords, he'd try to sell them to the local music stores. We ordered a bunch of plugs and shielded cable, and my dad got some boxes printed up with the name of our new company, Polson Products. (Get it?) My dad took the guitar cords around to a few music stores, performed the crackle demo, and sold them all. As a teenager, I earned a little pocket change repairing radios and other electronic devices for friends and acquaintances. In college, I majored in Electrical Engineering, receiving a BSEE degree from the University of Texas and an MSEE degree from Stanford University. Upon graduating from Stanford I stayed in what would soon become known as Silicon Valley, designing the RAM subsystem of a special-purpose computer. Over the next few years, I migrated toward software development. In 1979 I struck out on my own, starting a small consulting and custom software business. My wife and I moved to the Seattle area in 1982. Around 2002, a Tinsley Ellis concert rekindled my enthusiasm for guitars and guitar amps. I designed and built a few custom guitar amps for myself, using the vacuum tube technology I'd learned about as a boy. I began repairing amps for some of my musician friends. After moving to Lopez Island in 2007, I retired from the software business and founded Channel Road Amplification. Since then, I've repaired or modded dozens of amps for customers from San Juan, Orcas, and Lopez Islands. (Attention Shaw Island: I'm waiting.) I'm active as a musician on Lopez, playing bass and pedal steel guitar in a local band.